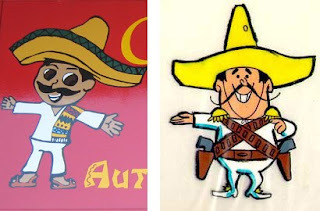 Notice how the sign maker, or the person commissioning the sign, taps into those tried and true Mexican stereotypes. I wonder...Is this dude related to the Frito Bandito? Perhaps the Case Vieja mascot should hook up with Fat Taco Boy or Freaky Tortilla Boy.